Alberta’s capital and home to Canada’s largest shopping mall and entertainment complex and the largest urban park system, Edmonton is a city that knows how to have fun. Join in the celebrations of more than 60 festivals that take place throughout the year from arts and culture, food and wine, theatre, music and sports. No matter what time of year you can find something happening and here are some top picks for a one, two or three days stay. Fort Edmonton Park: Begin your day at Fort Edmonton Park, the largest living history museum in Canada where costumed staff will take you on a journey back more than 150 years to experience what Edmonton was like during the days of the fur trade and pioneer years. The park is divided into four sections: The Fur Trading Era (represented by the Hudson Bay Company Trading Fort), The Settlement Era, The Municipal Era and The Metropolitan Era. The buildings and artifacts in each are typical of the times and interpreters will be walking around playing characters based on real-life individuals. Don’t be shy and ask them questions, they enjoy talking about themselves and you are fully encouraged to take part in all the activities throughout the park. Have lunch at Johnson’s Cafe of Fort Edmonton Park. After your visit, drive to Alberta Legislature grounds(for directions, see the map at the end of the article). This area, atop the banks of the North Saskatchewan River, is known to Edmontonians as “the leg” and is a marvel of Beaux-Arts architecture with marble pillars and carved oak. Free guided tours are offered hourly where you can learn stories about the portraits, magnificent art and the phenomenon known as the “magic spot”. On the main floor, you will find the brand-new visitors center which features the Borealis Gallery, Pehonan Theater and the Agora Interpretive Centre. At this state-of-the-art 4-D theatre you can go on journey with Princess Louise Caroline Alberta and actually feel the snow and wind on your face. 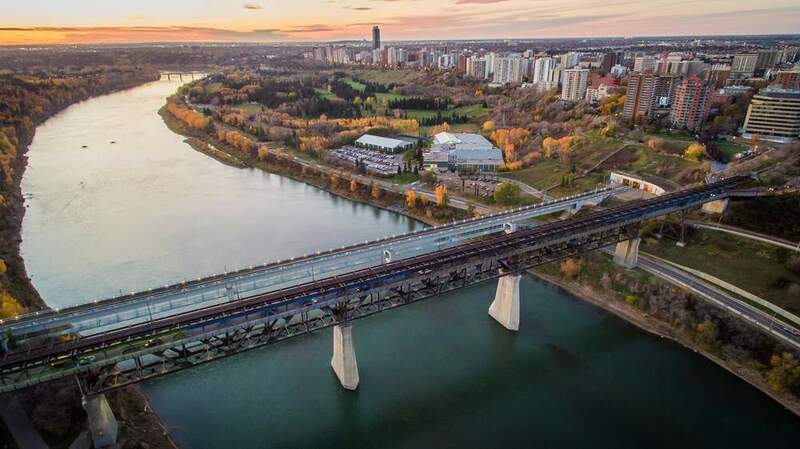 After your visit to the Legislature, get ready for an exhilarating ride a board a beautifully restored vintage streetcar to take in the sweeping views of the Edmonton River Valley and one of the highest river crossings in the world. This scenic tour that crosses over the High Level Bridge will teach you all about the city’s streetcar history. The route starts at the Strathcona Streetcar Barn & Museum, where you can see historic uniforms, tickets, streetcar parts and models, and ends at Jasper Plaza. Service operates hourly from May and October but check the schedule for exact times. Get on the Street Car at Grandin- Legislature Stop and continue to Starthcona Streetcar Museum. Your ticket is valid for the round Trip. If you have two days in Edmonton, you may ride the Street Car, the next day when you visit Old Strathcona. Strathcona Streetcar Barn & Museum is situated the North side of the Strathcona Farmer’s Market Building. Highlevel Bridge Street Car connects Downtown and Old Strathcona. So, if you have only one day in Edmonton, spend an hour or two exploring Old Strathcona. Continuing in this area on foot, walk through the downtown passing by the City Market (on Saturdays) on 104 St. where you will find delicious food trucks to refuel, live music, handmade goods and lots of fresh produce. This is a great place to pick up a unique Edmonton souvenir and grab some Moonshine doughnuts! Leaving the market continue walking until you arrive at City Hall and Sir Winston Churchill Square. Impossible to miss is the eight-story crystal pyramid that is the modern City Hall in the heart of the Downtown Arts District. During summer days, the square is bustling with festivals. Tip: If you’re visiting in July don’t miss one of Canada’s largest food festival, Taste of Edmonton, located at City Hall and Churchill square. During this 10-day event sample dishes from 60 locally owned restaurants and food trucks, attend culinary workshops and rock out to killer nightly music. 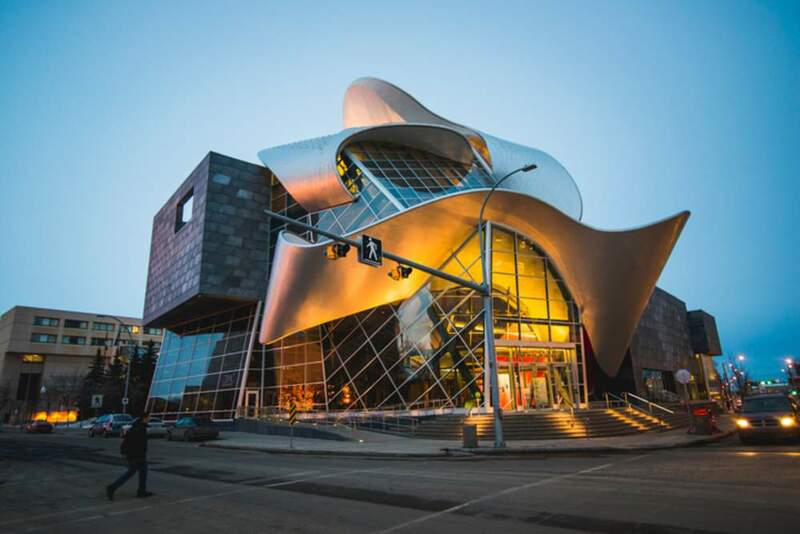 If you are interested in art, Art Gallery of Alberta located adjacent to the square has a collection of over 6,000 pieces. The AGA is the oldest cultural institute in Alberta and the only museum dedicated to the exhibition and preservation of art and visual culture. Twice a week, on Tuesday and Wednesday nights, admission is free between 5-8pm for everyone! Zinc Restaurant located on the third floor of AGA is a great venue for dinner after your visit to AGA. Edmonton downtown also have some fabulous restaurants. If you enjoy sampling craft beer, the urban gastropub, Craft Beer Market (10013 101A Ave NW), offers a selection of more than 100 microbrews, the largest selection of draft beer in Canada and local, seasonal pub fare. Interested in exploring Arts and Culture scene tonight? You may enjoy live concerts and live theatre shows at Winspear Centre or at Citadel Theatre or rock out with touring artists at Rogers Place. At night, you may also walk down 104 St. to visit the Neon Sign Museum. The first of its kind in Canada featuring a collection of 19 restored signs on the east wall of the Telus building, telling the story of Edmonton’s neon past. Live Music & Concerts in Edmonton this Month. Upcoming Concert Tours in Edmonton. Rise with the sun today and enjoy a leisurely bike ride or walk along Edmonton’s river valley, the largest urban park in Canada. This natural wonder consists of 160km of pathways and 20 major parks. The list of activities available inside the parks is endless with things like bird watching, skiing/skating, disc golf, fishing, golfing, boating and even hot air balloon rides. If you would like to take a guided tour, consider a Segway tour with River Valley Adventure Co. Whichever option you chose for exploring the River Valley make sure to stop at the Muttart Conservatory. 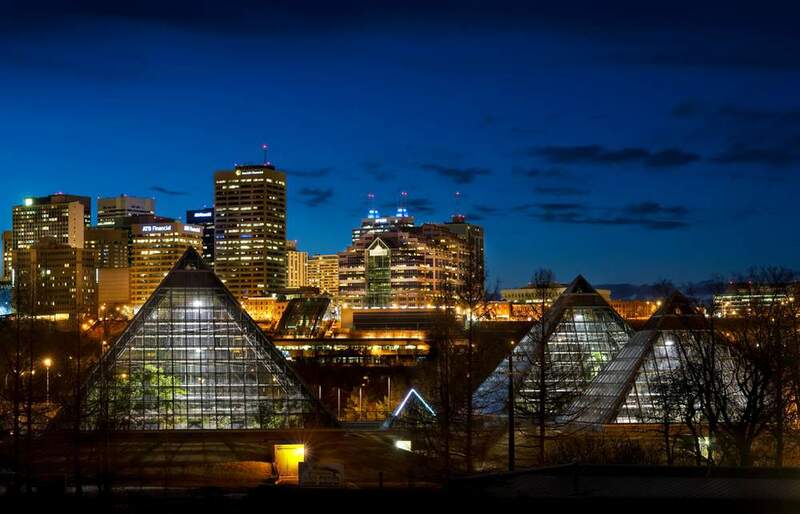 This innovative botanical garden with its striking glass pyramids, is the leader in plant science in western Canada. Three biomes are housed inside the pyramids and a fourth houses creative displays changing throughout the year. Head to Old Strathcona and the funky, bohemian spirited, Whyte Avenue. This historical district in south-central Edmonton has been ranked as one of Canada’s five best shopping neighbourhoods with a mix of historic buildings and trendy, one-of-a-kind shops, restaurants, cafes, bars. Old Strathcona is the venue of North America’s oldest and the most popular fringe festival – Edmonton International Fringe Theatre Festival (~ last 2 weeks of August). Lunch option: Among the Whyte Avenue options, Ampersand27 (&27) is crafted to be different. A menu which is a mishmash of familiar and faraway flavors using locally sourced, trendsetting ingredients. 10612 82 Avenue. Tip: If your visiting this area on a Saturday, the Old Strathcona farmers market with the philosophy, “We Make it! We Bake it! We Grow it! We Sell it!” makes a great stop. Or, open daily and throughout the year is the Old Strathcona Antique Market where you can find fine antiques and collectibles. Optional: If you are travelling with kids, you may also like to stop at the Science Museum, Telus World of Science. A non-profit organization motivated to inspire life-long learning through science and technology. In addition to having the largest planetarium dome theatre in Canada, you can enjoy time at Discoveryland, Environment Gallery, Health Gallery, Robotics Laboratory, Space Gallery, Kinetic Hall and Science Garage. Hours of fun for all ages! For the afternoon and night, drive or take local transit to Edmonton’s most famous attraction. West Edmonton Mall is the largest mall in North America and the tenth largest in the world. Inside, you will encounter more than 800 stores, an amusement park, waterpark, indoor lagoon, ice palace, adventure golf, movie theatres and more. With so much to see and do the rest of your day will most likely be spent here and it’s the perfect place for dining and nightly entertainment. Check out the laughs at Rick Bronson’s The Comic Strip, roll the dice at the Palace Casino or sip cocktails at the 300 Club Lounge. Today, hit the road and venture outside of the city. Located 35km east of Edmonton along the Yellowhead Highway, Elk Island National Park has played an important role in the conservation of the American Bison. Whether you come to Canada’s largest enclosed national park for wildlife viewing, hiking, cross-country skiing or boating, there is something for everyone to do. This year, to celebrate Canada’s 150th birthday and invite people to rediscover the peace and beauty of the prairie landscape, admission will be free! As you explore the park, keep your eyes open and see how many elk, white tailed deer and moose you can spot. And, look up to see if you can sight all 250 species of birds flying overhead! At the interpretive program, get answers to questions like, how fast a Bison can run, and how you could catch one? Or, join the Bison Backstage walking tour to really get behind the scenes and discover how Elk Island has helped to bring the plains bison back from near extinction. You’ll be taken through a labyrinth of corrals, catwalks, alleys and gates showing the techniques behind the successful conservation program. 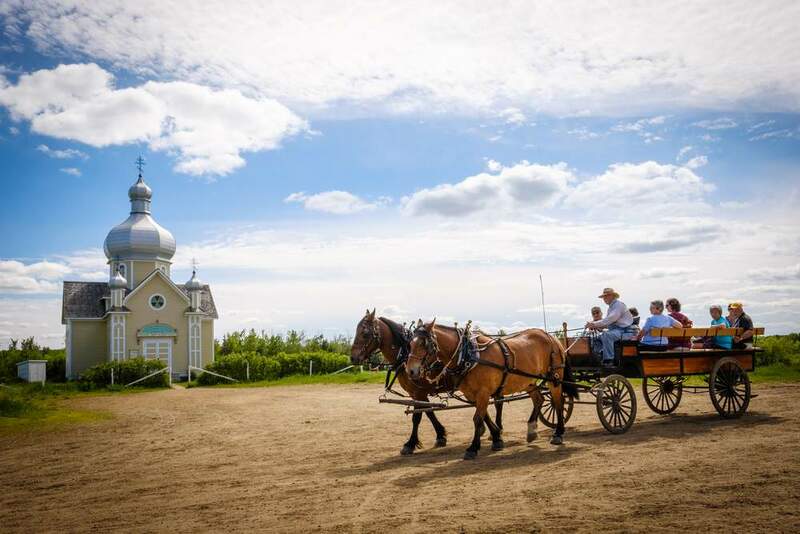 Located just 5km from Elk Island is Alberta’s Ukrainian Cultural Heritage Village, an open-air museum which recreates and shows the lives of the Ukrainian Canadian settlements during 1899 to 1930 in east central Alberta with the use of costumes and historical interpreters. Journey back in time and listen to real stories of the hardships and triumphs these people faced in Canada’s oldest and at one-time largest bloc settlement of Ukrainian pioneers. More than 35 relocated and restored structures can be explored including a sod house (burdei), a school, grain elevator, blacksmith shop and three churches of Eastern Byzantine Rite. Free horse drawn wagon rides are offered from Thursday to Monday as well as mouth-watering Ukrainina food like Borsch, potato cakes and kasha salad (not free!) during the summer months in the concession and diner. If you don’t have your own car to visit these places, don’t worry, you can join for an escorted tour. If you are visiting during the spring and summer it is likely there will be a festival going on to enjoy tonight. To name a few there are the Edmonton Folk Music Festival, International Fringe Theatre Festival, K-Days, Freewill Shakespeare Festival and Edmonton Pride Festival. Take a look for a complete list of what’s on and dates. Matrix Hotel: Located just a short walk from the Legislature Building in the downtown, this sleek and modern boutique lifestyle hotel offers exception hospitality and comfort at a reasonable price. Mettera Hotel on Whyte: Stay in one of the trendiest areas in Edmonton and experience great service and free amenities like buffet breakfast and wine tasting. Hotel Selkirk: For a unique hotel experience and unforgettable get away, stay in the reconstructed 1920’s hotel inside Fort Edmonton Park. All attractions and places are connected by Public Transport ETS, though it is better to have a car/call a taxi/Uber to get from one place to another, without wasting time. ETS Planner is well integrated to Google maps, so you can use Google maps to plan to trip using ETS. The above is a summer (Victoria Day to Labour Day Itinerary). If you are visiting in winter, see Winter in Edmonton. In Edmonton for a visit, why not go on a road trip to Jasper National Park?